With the development of the civilization every activity of human have become dependent on economic. National Income is one of the importance part of National economic. To know about countries economical strengths we get to have Ides of national income. It has great significant in our daily socio-economic life. Bangladesh is a developing country our total progress depend on some fixed thing that are agriculture, industries, state owned Enterprised, Power and energy, transport and communication and human resource development . Our economic totally depend on the these sectors. National income ascertains a country prosperity. Bangladesh is a developing country. We have many economical sectors which contribute in our national income. But, there are some problems in our national economic that hinder our economical progress some of these are backwardness of industry, restless political situation, restless industry, lack of skills, consistence of income and spend. If we want to improve our economical situation we get to remove this problems. We have to reduce the deficit between export income and import payment. To know about the national progress we have to count our gross national income. So in our socio-economical life national income accounting has a great significant. 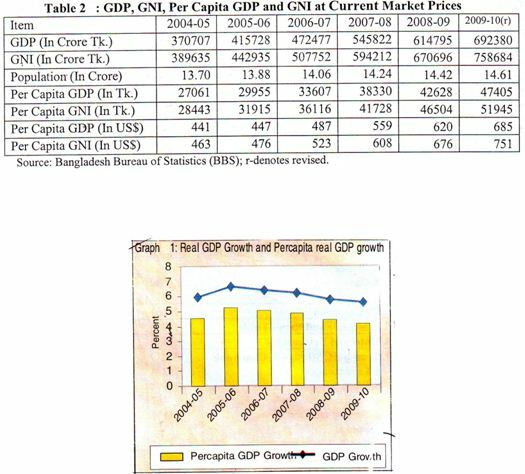 Economic of Bangladesh has many dimension according to Bangladesh bureau of statistics ( BBS) revised provisional estimate GDP growth (5.83%) was contributed by corresponding growth of agriculture, industry and service sector which grew by 4.6% and 6.3% respectively, Indicating satisfactory performance of all the three sectors of the economy. The share of services in GDP amounted to 49.88% followed by that of industry (29.88%) and agriculture (20.24%) at constant price. To count this we can know about overall economic position. So national account has great significant for a country. Rationalities of the study about national income has great value. To know about economical situation. To find out deficit between export income and import expenditure. 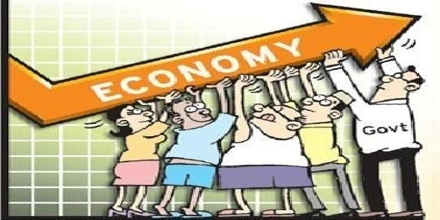 Find out shortcoming of economic. Contribution of main sectors such as agriculture, industry, human resource has been elaborately discussed here. And problem of this sectors. Moreover there is a brief critical discussion of other sectors such as power and energy privet sector development etc. National income accounting is very important for Bangladesh. It is not possible for me to collect primary data. For shortage of time I have depend on secondary data. So it is descriptive term paper. In this regard, data has been collecting from different type of research index, and several economical survey of Bangladesh. Try to describe individual sector of national income and its contributions in national income. If we see on the reports of Bangladesh bureau, we can get some basic conception about the wages, BBSC use 1769-70 as the base years. 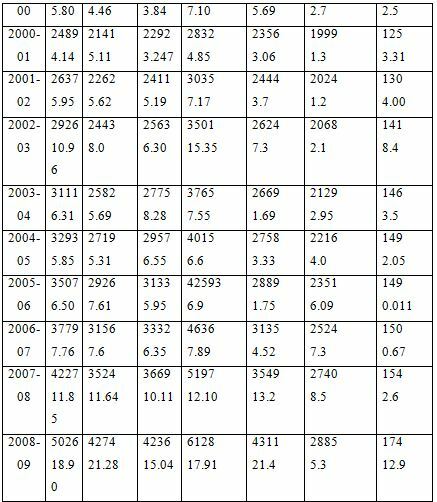 The wage rate index from FY 1999-00 through FY 2008-09 is presented in table: 01. It has been observed from the table that the nominal wage rate index is rising continuously and in FY 2008-09 the index rose by 18.90% compared to the previous fiscal year. The indices of all sectors exceed by 15% in FY 2008-09 of these, wage rate index of construction and agriculture sectors increased by 21.47% and 21.28% respectively. Compared to these sectors, wage rate indices of fisheries and industries sectors are slightly lower but have been the highest in the recent period it is to be noted that in FY 2008-09 the wage rate indices of fisheries and industries sectors increased by 15.45% and 17.19 respectively. MTMF considered positive trend in export earning, increased production of agriculture and industrial credit and the growth of imports of capital machinery and industrial raw materials for the projection of GDP growth. Moreover the MTMF envisaged that the growth of GDJP for fiscal year 2010-11 will be 6.7 % which will gradually increase to 7.2% and 7.6% in the fiscal year 2011-12 and 2012-13 respectively. As per vision 2021, the government will try to achieve 8% growth of GDP in 2013 and 10% in 2017. The GDP growth rate at constant prices and per capita GDP. GDP growth during FY 2004-05 To FY 2009-10 are shown in 2 Table 2 shows the GDP, GNI per capital GDP and GNI at current market prices. Another important sector of national income is remittance. According to the bureau of manpower, employment and training a total of about 70 lakh Bangladeshi workers went overseas during 1976 to June 2010. A total of 4.27 lakh Bangladeshi worker went abroad for employment in FY 2009-10 which is 34.34 % lower than the previous fiscal year. In FY 2006-09 the remittances from expateiats Bangladeshi workers stood at US$ 9689.16 Million reflecting 22.42%. rise over the previous year. In 2009-10 remittances shot to US$ 10987.4 Million reflecting 13.4 % rise over preceding year. According to the world bank report on migration and remittance trend 2009. Bangladesh secured 12th position among the remittance earning countries in 2008. In 2009 Bangladesh secured the 8th position in this year Bangladesh earn 2.55 % of the world remittance. Here the table has shown. The export earning of Bangladesh stood at US$ 16204.65 million in FY 2009-10, which was 4.11 percent higher than the export earning US$ 15565.19 of Fy 2008-09. The growth of export earning is mainly attributable to increases of export of jute goods petroleum products, engineering products, and agricultural products during the year under report. 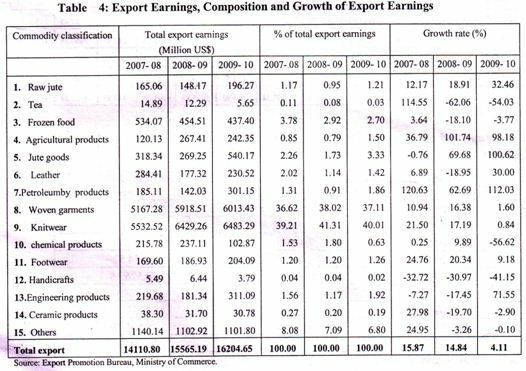 An analysis of composition of exports of 2009-10 by major categories reveals that export earning over the last fiscal year increased mainly for increases of petroleum by product (112.03%) , jute goods (100.62%), agriculture product (98.18%), engineering products (71.55%), raw jute (32.46%) , leather (30.00%) foot wear (9.18%), woven garments (1.6%) and knitwear (0.84%) on the other hand, export earning decrease in chemical product (56.62%), tea (54.03%), handicrafts (41.15%) , frozen food (3.77%) and ceramic products (2.90%). Agriculture is an important sector of economy of Bangladesh and one of the main drivers of national income. Thought the role of agriculture for national economy in Bangladesh is decreasing day by day and at present it is 31.16% of GDP. But we can not ignore its role. About 84% of the total population live in rural areas and are directly or indirectly engaged in a wide range of agriculture activities. This sector ensures food security which is of significant importance to all in Bangladesh where 44% people are living under the poverty level. The contribution of this sector to GDP stood at 20.49% in FY 200-09 according to the revised estimate of BBS the overall contribution of the broad agriculture sector at constant price is 20.24 % of GDP in GY 2009-10. The growth of broad service sector, particularly the growth of wholesale and retail trade, hotal ad resturants, transport and communication sector is strongly supported by the agriculture. About 43.6 % o the total labour forces of the country are engaged in agriculture sector (MES 2009BBS). In current fiscal year (FY 2009-10) , Bangladesh earn US$ 687.53 mullion by exporting agriculture product with is 4.24 % of total earning (US$16204.65million) . Within the broad agriculture sector in FY 2009-10 the contribution of agriculture and forestry and fisheries are estimated it 15.79 % and 4.49% respectively (revised estime of BBS). In Fy 2008-09 the eontribution of the two sectors stood at 15.91% and 4.58% respectively. Electricity and gas and water supply. Among this sub sector the contribution of the manufacturing sector is highest. According to the GDP data released by BBS, in FY2009-10 the contribution of the manufacturing sector to GDP is 17.86 percent which was recorded 17.9 percent in FY2008-09. Again according to the BBS data the growth rate of manufacturing sector is 5.73 in FY-2009-10. The size and growth performance of manufacturing sector is 5.73% in FY 2009-10. The size and growth performance of manufacturing sector in the country, GDP from FY. National income accounting is most important and critical matter of our national life. It is not possible for me to collect the primary data for shortage of time, I have not collected much data about the subject matter. Truly i have to depend on some research book and data. So mu term paper is not full of information. Mainly my way of the work is some secondary data base . I take the data as my working tools and I analysis the fact and try to find out the main sectors and sub sectors of our national income. Some of my friends sahida, Juni, Nargize, Raba involve in the study. They all help me to make the term paper. They also help me to collect the data as well. Our teacher mainly Laila Hossian and Md. Akbar Ali Biswas help me to propare the tram paper. Their instruction paves the path to collect the information . overall twelve members involve to prepare the term paper about the topic. From our study of national income accounting we find several sector contribute in national income. Form the data we find the contribution of service sector have been increasing day by day and contribution of the agriculture have been decreasing. From the analysis of the data we find the picture of overall economic. Pervious time our main income sector is agriculture but now. Industry and service take the place of agriculture. From, the data we find people of our country have the tendency to join industrial sector and most of them have trend to go abroad. That way the service sector are become the main sector of our economic . The growth rate of agriculture and forestry sector would rise by 0.77% points in FY 2009-10 due to the increase in production of all sub sector. Total inland and marine catch in FY 2009-10 as estimated by the directorate of fisheries was 2.9 Million metric tonnes which was 7.26 % higher then that of the previous year. Electrify, gas and water supply. Social and personal service activities. If we want to describe about national income accounting first we get to describe about agriculture industry human resource. Table one shown the production increases but the table -4 show the contubution the agriculture are decreasing but growth rate is increasing, for this reason sector share of GDP of agriculture are increasing. on the other hand manufacturing production are increasing and sectoral growth rate are increasing as well. Moreover industrial contribution are increasing from the service sector we can see it become most important sector in national income. However contribution of the service sector weathered such fluctuation and remained unchanged at 49-50 % during the same period. By analysis the sectoral growth rate within the period it has been observed that unti FY 2008-09 industry sector should as increasing trnd of growth compared to agriculture n FY 2009-10 the agriculture and service sector were expected to grow by 0.55% the growth of the industry sector would decline by 0.45 %. 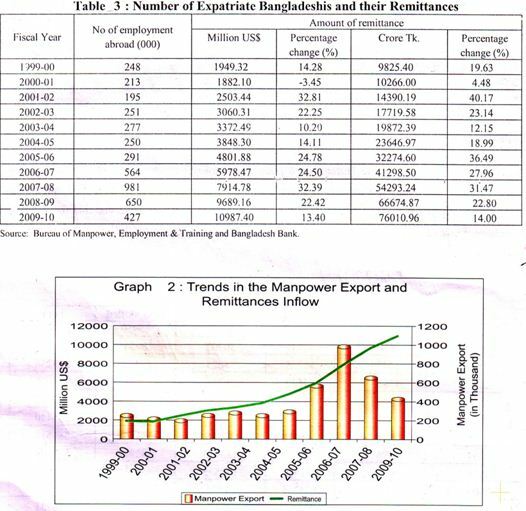 The remittances from expatriate Bangladeshi workers stood at US$ 9689.16 million reflecting 22.42 % rise over the previous year, In 2009-10 remittance shot us to US$ 10987.4 Million reflecting 13.4% rise over the preceding year. The amount of remittances in rerms of GDP and export earning have also incerased over the year. In FY 2003-04 remittances as percent of GDP and export stood at 5.98 % and 44.47 % respectively. In FY 2009-10 remittances as peresnty of GDP and export were 11.13% and 67.80% respectively that show.